This will be the last of the XC8 series for PIC18. Next will be bunch of projects (hopefully I’ll get the time). ADC is the last topic. There are too many stuffs, but the point is read the datasheet. Datasheet tells you everything and my previous posts will give you an idea of linking datasheet with peripheral library and use in your application. ADC in PIC18’s are of 10 bit resolution. Way too good for most of our needs. 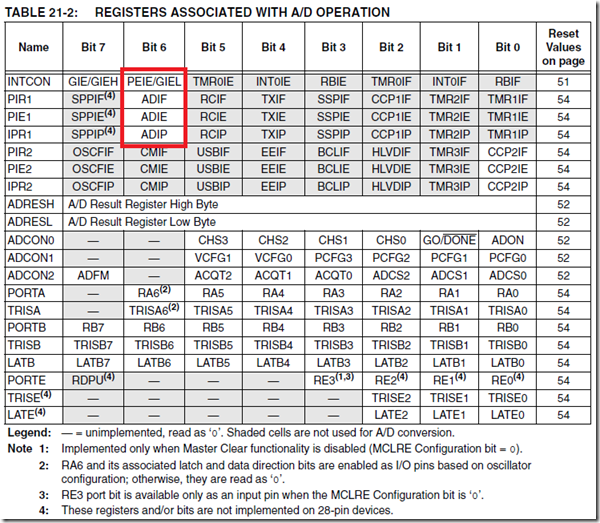 Before complaining about ADC not working, are you sure you read every word of the datasheet and understood it? ADC’s have a lot of configuration. Going for high sampling rate is not always good. You got to set the acquisition time for your ADC. Lot of people make mistake with the settings and sampling rate of the ADC. For my tutorial I’ll be using a potentiometer. Not a big deal with the sampling rate. But still will give you an idea of setting the interrupts and other features. Note : All the above list may not be applicable to all controllers. Please read the datasheet. In lot of places you would have seen polling method. So I wont be showing that. In our method the ADC will trigger an interrupt after conversion is complete. How did I know it takes 3 arguments? according to library there are also OpenADC function with only 2 arguments? Well, read the datasheet and select your OpenADC with the available registers. My input is a potentiometer, so not a big deal with the settings. Select your TAD according to your requirement. ei();       //remember the master switch for interrupt? Thanks for the quick reply! However, I am using the PIC18F23K20, and I do not believe that the Rx pin is shared with the ADC. However, I still set the ANSEL equal to 0x00 (ANSELC is not predefined in the xc8 compiler), and I was still unable to see a change on PuTTY. You are right.. Its not been shared. Try working with one character echo. Then move your way up. Also try to use microchip forums if you can. They are pretty quick. But you might have to post your code in there if you need a better reply. Alex :@singularengineer Thanks for replying! Yes, that is precisely what I did and I have fixed the problem. I am now trying to configure UART to work with my project. Can you perhaps provide information on the serial monitor you are using? Maybe provide a link to it? I am currently using the arduino integrated monitor, but I am getting strange ASCII results. So, it turns out I needed to increase the baud rate on the serial monitor to 19200 so that I didn’t get garbled data (I do not know why since the baud rate is set to 9600 in the code). I have also transferred to PuTTY instead of arduino. Now, I am trying to user your Rx interrupt code that you posted in your UART tutorial. While testing it, I found that when I type something in and press enter, the PIC does not seem to transmit anything back to the PC as the PC monitor does not echo what I typed. Can you provide any help or an explanation? Thanks. P.S. I know that this is in the wrong section of your website, but since I already made a post here, I might as well continue… sorry for any inconveniences. For most PIC18’s the UART RX pin is shared with ADC. So you may have to make your RX it into a Digital I/O. Use ANSELC = 0x00; to convert all pins in PORTC to digital. Also try one character echo and then move your way up. Remember ANSELC=0x00; will make all pins in port C to be I/O. If you had and ADC working on port C, they will stop working after its made into digital. Increasing the baud rate to 19200 on the serial monitor fixed the result to what I wanted. However, I do not understand as in the code it is set to 9600… Any idea why? Thanks for replying! Yes, that is precisely what I did and I have fixed the problem. I am now trying to configure UART to work with my project. Can you perhaps provide information on the serial monitor you are using? Maybe provide a link to it? I am currently using the arduino integrated monitor, but I am getting strange ASCII results. Hi, I do not know if you still check the comments on this website, but I thought I would ask my question. I would like to read multiple channels of the ADC at 1kHz or so. 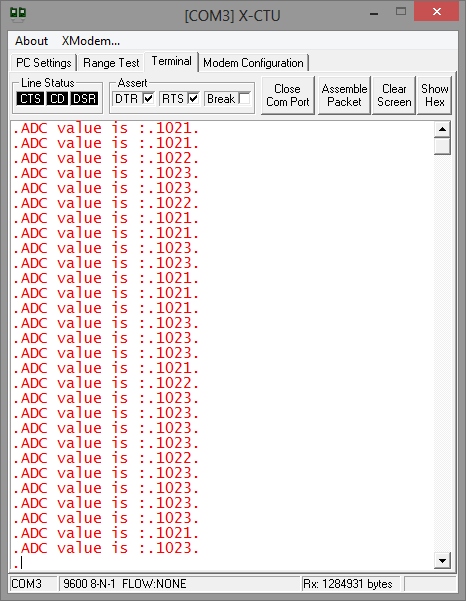 I was attempting to read the ADC with a timer0 interrupt running at 1kHz, but that does not seem to work. 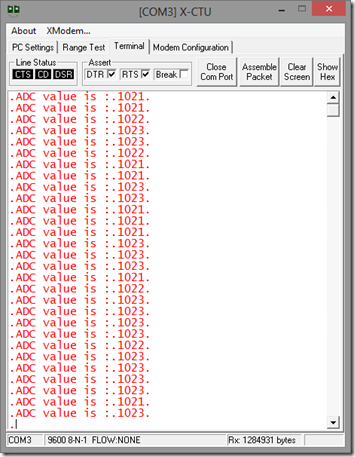 I would use the ADC interrupt, but I could not easily configure it to read in the frequency I required. Do you have any suggestions? I can post my code if necessary. Sorry for the delayed response. Yes, I still check the comments. How many channels do you like to read? What is the maximum ADC speed? and What is the Tad (time to acquire) per channel? Also, how many ADC’s do you have in the controller you are using? If possible try to use all ADC’s to effectively give enough time per channel to acquire your signal properly. I would highly recommend you using the microchip’s forum since they are very quick to help you. I wont be active until April. According to PIC18F45K50 datasheet table 29-23 TAD is 1uS and aquisition time is 1.4uS which is the minimum values. So if we are running at 8Mhz FOSC then minimum of ADC_FOSC_8 for adc clock and ADC_2_TAD can be used. Is it correct configuration or am I making any mistake here? I solved it 🙂 thank you for all! Thank you anywhere, I’ll try to change PIC and we will see… the thing that drives me crazy is that in debugging mode it works! It’s like when you hear a noise from your car and when you go to the mechanic to check it the noise stops! If someone has any kind of help I’ll be very grateful to him! Thanks for all and have a nice weekend! Is there a way you can zip it and upload to a ftp server and put the link here? Sorry can’t help you anymore, this is all i knoe for now. Hopefully you figure out your issue. Try this, very easy, no interrupts, try to get your ADC to work first, I haven’t tried this with the PIC18F46K22 yet. Hope this helps. Thanks for the quick snippet. syntax is correct and the problem is not in if clauses. I’m really sorry for this multiposts. Thank you again for put up with me! I got some updates on my problem. I’m going crazy on this but I’ll come out! 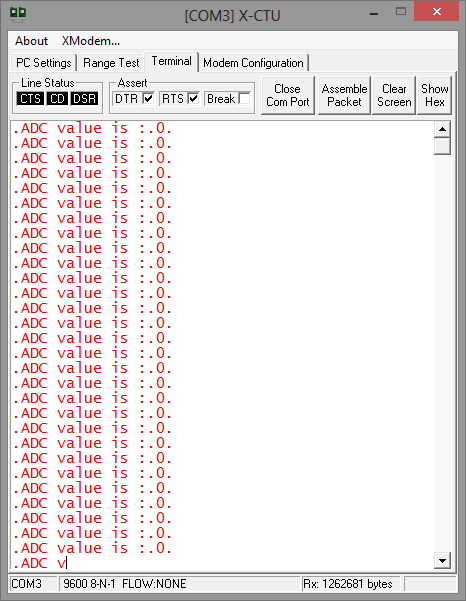 I’m debugging it with many changes and tryes… I noticed that OpenADC(…) is not configuring it as I would but if I set all registers associated with ADC (ADCON0, ADCON1, ADCON2, ANSEL) it “works”: I put the double quotes on works because it works only if I toggle a breakpoint in debugging mode, but in normal funciton it doesn’t works! It seems that ConvertADC() doesn’t restart conversion! then I see ADCval and ADRES(high and low) that changes values from time to time but if I load the project on MCU it doesn't do nothing! Anyone got any idea on why this could happen? Because I don't. Anyway if you can help me, I will be really gratefull to you! @Carl Hi! Normally it’s in C:\Program Files\Microchip\xc8\v1.30\docs or something like. It’s a pdf with all (or almost all) supported chips. Look in that folder and if you don’t find it try to google it! Sorry for approximative informations but I dont have my pc now! Great post, I only have one question. About 1/5 in your post you mention about “peripheral library” and the function OpenADC. How do I know which OpenADC function to select and its configuration by reading the datasheet. 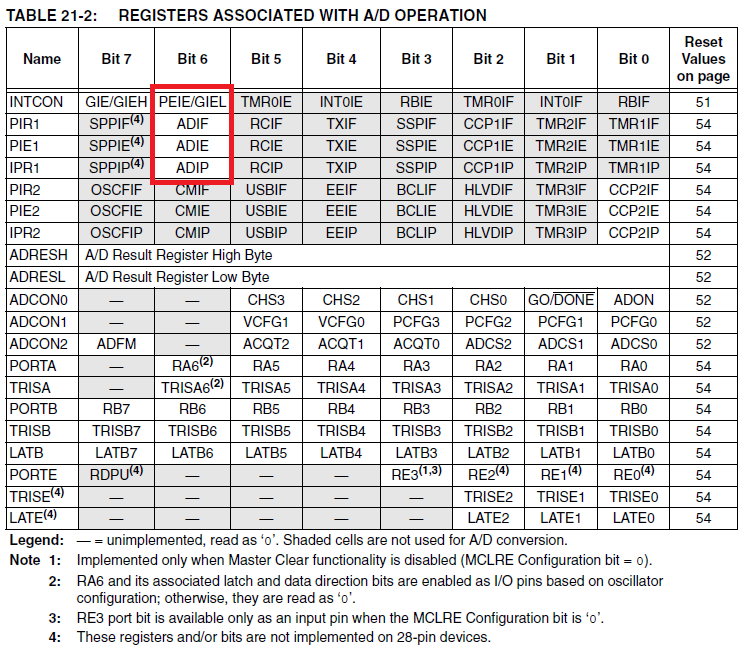 From the data sheet I get what would be required to do just by setting the ADCON registers but not sure how to translate different PIC to different OpenADC. Just an example of this is PIC18f4520 & PIC18f46k22 have different ADCON registers (mostly ADCON1 is different), would I configure OpenADC the same? and there’s a change, but it’s only that now only the first led (RC0 pin) is on (like adc is reading a value less than 256. I’m a little bit perplexed, because on the peripherial library, looking to my pic adc’s table, at OpenADC function there are some things that I’m not understanding, for example why ADC’s channels starts from CH3 and goes to CH11? Datasheet says that there are AN0-11! Am I missing something, like using wrong channel or settings? thank you again! There are some things to be noted in your code. Check your if conditions. You are using ‘=’ instead of ‘==’. 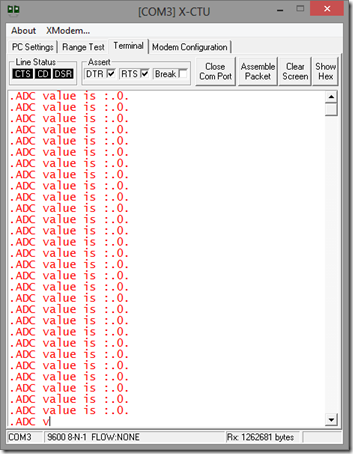 ADC is 10 bit resolution. I dont know what you are doing with 4 bits/LED’s. Please use microchip forums for a quick reply (and may be even debug your code). I stumbled into this site and found your clear explanations and well-documented code. I’m just making the transition to XC8 and this was very helpful. Thanks. Thanks very much for the tutorials. Much appreciated effort. God Bless. Thank you so much for these tutorials! Given that Microchip haven’t published a whole lot of tutorials or guides on the subject, or 3rd party books on XC8, your small tutorials on each section have helped me greatly so far!